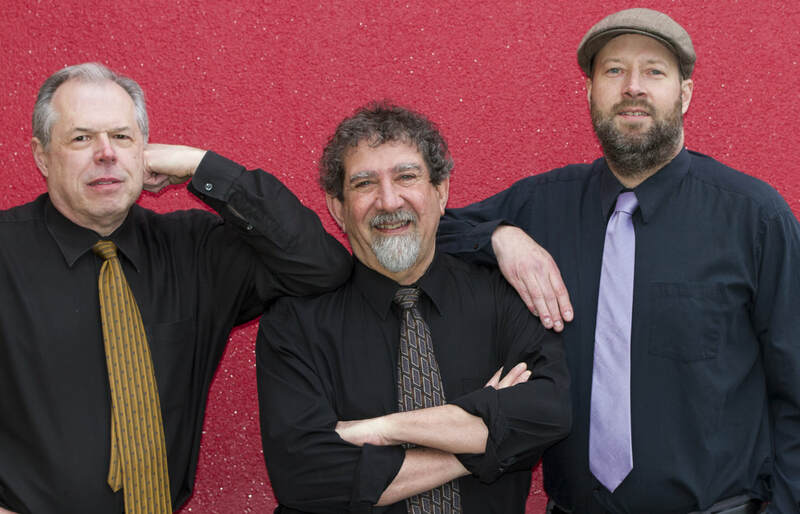 The Green Street Trio is (from left to right) George Kaye on bass, Paul Arslanian on piano, and Jon Fisher on drums. PAUL ARSLANIAN - Pianist, Composer, Educator. Paul started his professional career as a pianist, composer for dance and theater, and dance accompanist in San Francisco during the 1970s where he led his own jazz and Latin ensembles and was composer and pianist for the Bishop Norman Williams Quartet. He has recorded with such notables as Pepper Adams, Pharaoh Sanders, Dave Liebman, Woody Shaw, and Bill Summers, and been a sideman with Freddy Hubbard and Terri Gibbs. In 1979, Paul co-founded the Jazz Tap Ensemble and as music director worked with tap dancing greats Honi Coles, Foster Johnson, Cookie Cook, Eddie Brown, Harold and Fayard Nicholas, Buster Brown, and many others. Since relocating to the East Coast in 1984, Paul was pianist for the Archie Shepp Quartet for two years, released his own recording entitled "It's the Feeling That Counts", and toured extensively throughout the U.S. and Europe as music director for numerous productions, including Dance Umbrella’s Fascinating Rhythms tour which featured Savion Glover, Jimmy Slyde, Gregory Hines, and drummer Alan Dawson. Paul’s jazz compositions have been recorded by George Coleman, John Hicks, Roy Hargrove, René Roznes, and Bertha Hope. From 1999-2017 Paul was a Lecturer in dance, teaching music to dancers and accompanying classes for the University of Massachusetts Amherst Dance Department. He has also been pianist and coordinator for the weekly Northampton Jazz Workshop series since 2010. Paul holds a Bachelor’s Degree from University Without Walls at UMass (1991) and also attended Colorado State Univ. and Berklee College of Music in Boston in the late 1960s. Starting as a self-taught musician, George learned from jazz recordings of Miles Davis, Wayne Shorter, Blue Mitchell, Bill Evans, Ornette Coleman, and Dave Brubeck. In the mid 1970’s George started performing with Nick Brignola and the local musicians of the Albany, New York area. In 1981 he moved to New York as a freelance jazz bassist. He attended Manhattan School of Music (MSM) earning a Bachelors of Music degree in 1997. While at MSM he became the bassist for the Houston Person/ Etta Jones group with whom he played until 2001. George has performed with many other jazz notables including Randy Brecker, Slide Hampton, Ted Curson, Doc Cheatham, James Spaulding, Dakota Staton, Mose Allison, Nicholas Peyton, Al Gray, and Norman Simmons. George has appeared at many major jazz venues including the Village Vanguard, NYC; Jazz Showcase, Chicago; Blue Note, NYC; Sweet Basil’s, NYC; Jazz Bakery, LA; Blue Note, Tokyo. In addition, he has performed on Annual Floating Jazz Festivals, toured Norway, France, Spain and Japan. In 2015 George earned a Masters of Music in Jazz Composition and Arranging at the University of Massachusetts Amherst. He is a faculty member at the Vermont Jazz Center in Brattleboro, and the bassist in the Green Street Trio since 2010, which hosts the Northampton Jazz Workshop every Tuesday night at Sparetime Northampton. Jon Fisher is a freelance drummer based in Western Massachusetts who has been performing with various artists throughout New England for almost 20 years. He is a member of the Green Street Trio, with whom he’s had the opportunity to perform with a myriad of Jazz luminaries, including Charles Neville, Houston Person, Vincent Herring, Grant Stewart, Wayne Escoffery, Chris Cheek, Jay Hoggard, Steve Davis, Sheila Jordan, Karrin Allyson, Nat Reeves, John Lockwood, Gary Smulyan, Ralph Lalama, and many others. Jon also leads his own group, which he works with regularly in and around the Pioneer Valley. Notable performances include Birdland (Jan 2017), The Burlington Discover Jazz Festival (2009-2014, 2017), The Northampton Jazz Festival (2010-2014) and The Blue Note Jazz Club (2009) with the late, great guitarist, Melvin Sparks.